Champions League Betting Tips: Who will be the competition’s top scorer? The 2018/19 Champions League resumes this week after it’s winter hiatus, and some of the continent’s leading goal-getters will be fine tuning their poaching skills ahead of the first knock out round of this year’s competition. Juventus star Cristiano Ronaldo has topped the Champions League charts in each of the competition’s last 6 seasons, but having scored only once so far in this year’s competition, the Portuguese superstar is set to observe the race to be the tournament’s leading scorer from a distance for the first time in around a decade. Several of the world’s most expert finishers and match-winners will be aiming to fill the sizeable Ronaldo-shaped void however, and that means that there are some potentially lucrative looking odds and prices to consider in the 2018/19 Champions League Top Scorer markets. Make sure to also check out our selection of Champions League betting specials here! Bayern Munich’s perennial prime poacher Robert Lewandowski is currently out on his own as the Champions League’s top scorer, having smashed home 8 goals in 6 Group game appearances for the Bavarians. On the surface, it looks as if Lewandowski is already well on his way to matching the career-high 10-goal Champions League haul he collected for Borussia Dortmund in 2012/13, however, his current continental campaign might be about to come to an abrupt end. Bayern Munich face a daunting Last 16 double-header with Liverpool over the next month, and with Jurgen Klopp’s men favourites to qualify, Lewandowski could be denied the chance to add more Champions League goals to his tally. Lewandowski is priced at 11/4 with bet365 to be top scorer, and even though his current 8 goal total could conceivably be enough to land him the award, we think it’s far likelier that his total will be eclipsed by his rivals, with Bayern expected to struggle against a rampant looking Liverpool. Lurking ominously behind Lewandowski on 6 goals is the indomitable Lionel Messi. The Champions League’s second highest scorer of all time has once again been Barcelona’s most creative and productive match-turner this season, hitting 29 goals in all competitions so far this term. Remarkably, Messi smashed home his 6 Champions League goals this season in just 3 starts before Christmas against PSV (twice) and Tottenham respectively. 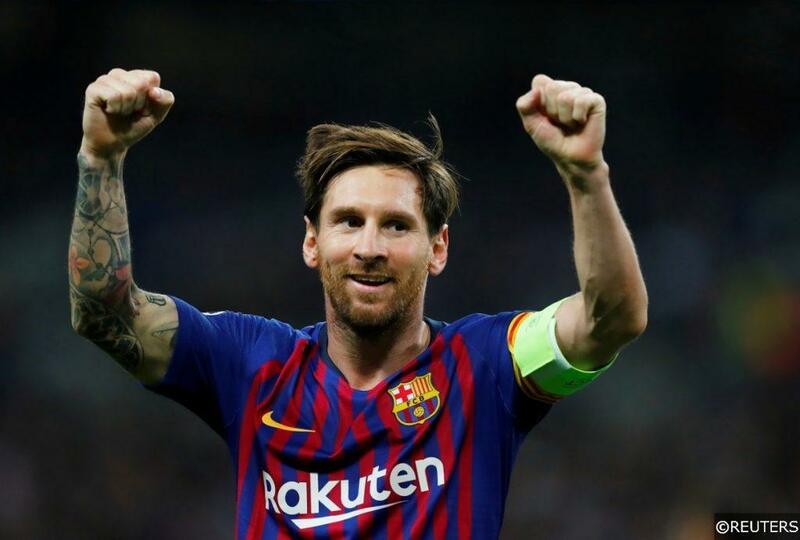 With Barcelona among the favourites to win the competition outright this season and Messi central to every facet of their attacking play, the diminutive schemer looks fantastic value at 7/4 with bet365 to finish top of the Champions League goalscoring pile this season. Behind Lewandowski and Messi, are a clutch of players locked on 5 Champions League goals each. Edin Dzeko, Paulo Dybala, Dusan Tadic, Moussa Marega and Neymar make up that group, though for varying reasons, none of them look great value in the top goalscorer stakes. Roma’s Edin Dzeko is an accomplished goal-getter, though Roma’s flirtation with Champions League football in 2018/19 is expected to be much shorter than it was last season when they reached the Semi Finals. 4 of Paulo Dybala’s 5 Champions League goals so far were scored in games against Swiss makeweights Young Boys, and if you look beyond the Juventus attacker’s continental numbers, Dybala is generally having a unusually underwhelming season in front of goal. Dybala has scored just 2 goals in 17 Serie A starts for the Old Lady since the summer, and barring an incredible spike in his output, it looks as though he will be left in the dust by his more clinical counterparts. Dusan Tadic and Moussa Marega of Ajax and Porto are expected to exit the competition inside the next 2 knockout rounds, while Neymar’s 10-week injury absence could deny him his shot at glory with PSG. Real Madrid’s regression at the start of the 2018/19 under Julen Lopetegui was startling, though the current Champions League holder’s gradual improvement under Lopetegui’s replacement Santiago Solari has been accelerating and turning into genuine momentum in recent weeks. Alongside that momentum, Real have the experience and big-game knowhow in their ranks to help them navigate the unpredictable waters of Champions League knockout football, and as always, Benzema will be leading Los Blancos from the front. Admittedly, the 31- year old has scored just 3 Champions League goals so far this season, but with Real looking well equipped to make it to the latter rounds of the tournament again, Benzema should have ample opportunity to bolster his numbers. Read our detailed Ajax vs Real Madrid match preview, complete with betting tips and predictions here. At first glance, it might seem silly to include a player with just 2 Champions League goals to his name this season among the candidates to finish as the competition’s top scorer, but Manchester City’s Sergio Aguero could be gifted the set of circumstances he needs to launch himself into contention. Man City were drawn against arguably the weakest team left in the competition in Schalke 04 in the Last 16, and Pep Guardiola’s men are almost certain to rack up a meaty aggregate scoreline against the 14th placed Bundesliga strugglers. Read about City’s and the rest of the Premier League clubs’ Champions League chances in more detail here. 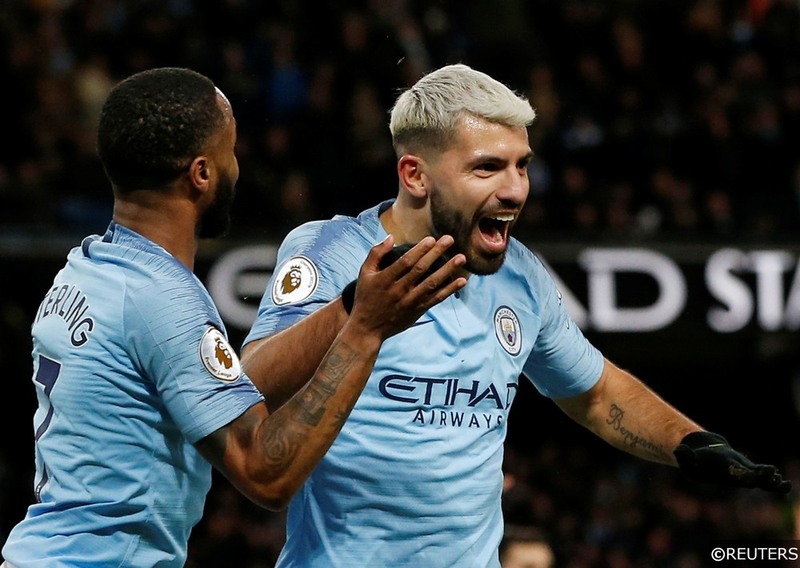 Aguero is certain to be at the sharp end of City’s slick attacking play again, and the explosive Argentinean international will enter next week’s first leg against Schalke on the back of 9 goals in his last 6 appearances. If City can put Schalke to the sword in convincing fashion, Aguero might just grab the goals he needs to make his current 20/1 Champions League top goalscorer odds with bet365 look incredibly good value, incredibly quickly. Check out the rest of our match previews, predictions and betting tips for the rest of this week’s Champions League action here! Categories: Betting Strategy, Blog, Champions League, and Football. Tags: Champions League, champions league betting guide, champions league betting tips, champions league tips, champions league top scorer tips, karim benzema, Lionel Messi, Robert Lewandowski, and Sergio Aguero. Team Tag: Barcelona, bayern munich, manchester city, and real madrid. Sports: Football.